Have you ever hiked in grassy areas and got the feeling that something is crawling on your skin? Chances are it could be a tick. 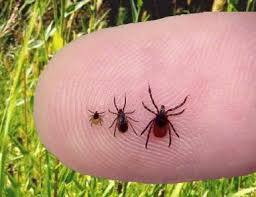 Experienced hikers always use insect repellent medication on their skin to deter ticks. This is not because tick bites hurt, in fact, they seldom do. Applying insecticides is mainly for deterring ticks since they cause many deadly diseases. What to do if you find a tick on your body? Grasp the tick firmly from its head using a pair of tweezers. Do not squeeze. Remove it out firmly in the upward direction. Bag the tick right away for identification. Make sure no mouthparts are left behind in the skin. If the body is removed but the head remains in the skin, use a sterile needle to remove it. Immediately wash your hands and the bitten area with warm water and antibacterial soap. Apply antiseptic cream to the area. If you are unable to remove the tick by yourself, call your doctor or go to the nearest hospital to have it removed. Does removing a tick hurt? Usually, if you do things right, it should not hurt to remove attached ticks. Make sure you use a clean pair of tweezers to do the job. Avoid using your hands or nails as this could spread infection through cuts in your skin. If you do not have tweezers, you can use clean tissue paper or a sterile needle to pull the tick out. Never ever use matchsticks or fire to burn the ticks. This can be extremely dangerous and could lead to serious burns. Also avoid use of petroleum jelly, rubbing alcohol and fingernail polish as these methods do not work and could even spread the infection by causing the trick to regurgitate inside your skin. Do tick bites itch and swell? Ticks bites normally do not itch or swell. If you experience a red bull’s eye rash or fever or any unusual symptoms following the bite, you must seek prompt medical help.If the bitten area develops a blister and pus or the bite looks worse, seek medical help immediately. Ticks are stealthy creatures. You won’t feel the tick bite you but you might feel it crawling on your skin. You might even chance upon it attached to your skin when you examine yourself after a long hike. Ticks bites do not hurt mainly because ticks inject a chemical into the blood to prevent the substance that causes humans to feel or register pain. An adult tick might even remain attached to the hosts’ body for a week where it can continue feeding without being noticed. As part of early treatment for tick bites, the first step is to remove attached tick. Apply antiseptic cream or ointment liberally on the bite. If the rash is itchy, apply 1% hydrocortisone cream on it. Complications of Lyme disease and other tick borne illnesses can be prevented by treating the disease early on. Your doctor might order a few tests to ascertain the antibodies present in the blood. Based on the results, they will prescribe a dose of antibiotics to you. Make sure you take the medicines as indicated. Failure to complete the dose so could lead to several complications of Lyme disease and other conditions caused by ticks. Doctors know a lot more about Lyme disease today than they did in the past. They know that the right dose of antibiotics taken for the prescribed duration of time can cure Lyme disease right away. Problems arise when the infection goes untreated-which can occur frequently because ticks bites do not hurt. You probably will not feel a tick bite you. So the best thing to do is take precautions to ensure this does not happen.